The year is 2029, and mechanically augmented humans have now been deemed outcasts, living a life of complete and total segregation from the rest of society. Now an experienced covert operative, Adam Jensen is forced to operate in a world that has grown to despise his kind. Armed with a new arsenal of state-of-the-art weapons and augmentations, he must choose the right approach, along with who to trust, in order to unravel a vast worldwide conspiracy. Deus Ex: Mankind Divided – Breach is an innovative game mode, included for free with Deus Ex: Mankind Divided. 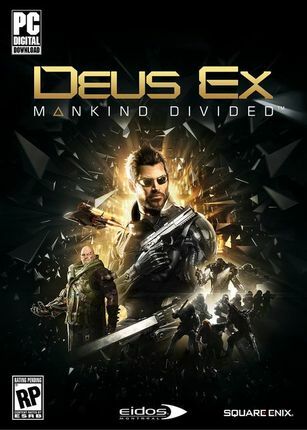 This new take on the game offers, for the very first time, an arcade approach on the gameplay of Deus Ex: Mankind Divided, providing players with a connected puzzle shooter experience. As a Ripper, a hacker in the year 2029, your objective is to obtain and sell highly classified corporate data by infiltrating some of the world’s most secure servers, using the funds you acquire to upgrade both your skills and arsenal.